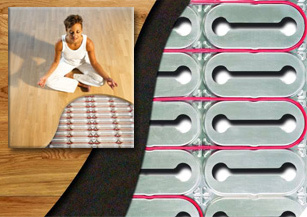 Warmzone offers a wide variety of the most trusted radiant floor heating solutions on the market. Because we are not limited to offering products from one manufacturer we are able to carry a wide selection of proven radiant heat systems. In addition to our superior products, we also provide comprehensive engineering and design services. When you purchase a floor heating system from Warmzone, you'll have the peace of mind, knowing that a professional team of radiant heat experts is working to provide the most efficient system, custom designed to meet all of your specific needs, while keeping within your budget. Review the information below and call us today at 888.488.9276 to determine the floor heating system that best fits your needs. One of our radiant floor heating experts will be happy to answer any questions you may have and provide you with additional, unbiased information. 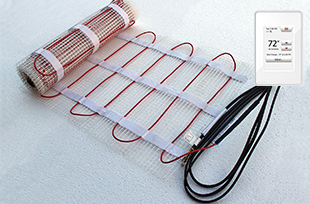 ComfortTile floor heating mats include a rugged heat cable that is pre-spaced and placed on a fiberglass mesh with adhesive backing, allowing for quick, simple roll-out installation. The heated floor mats can be easily installed directly under tile, natural stone or other surfaces to provide comfortable, even floor heating for your bathroom, kitchen, entryway, or other hard surfaced areas. The CT floor heating mats are compatible with all standard sub-flooring materials, and its low 3/16-inch (3 mm) profile also make ComfortTile heat cable ideal for renovations. The system is one of the most trusted and popular floor heating systems available. The radiant under floor heating system consists of thermostat-controlled heating cables that are fitted under the surface of the floor to provide safe, evenly distributed heat. 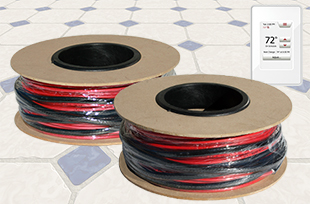 The thin, twin conductor heat cable off the spool is particularly suited to odd, custom shaped floor heating jobs, allowing installers to make all the necessary adjustments of cable spacing and coverage on-site. Cable strapping is used to secure the cable for the required spacing. The Prodeso membrane with ComfortTile heat cable is an outstanding and efficient, cost effective system for heating floors. The CT heat cable is easily installed and spaced in the grooves of the patented membrane. 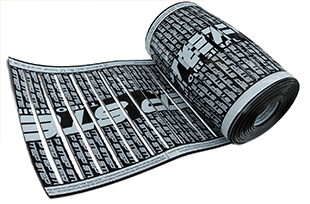 The Prodeso membrane is quick to lay out, which helps to reduce installation time and cost. 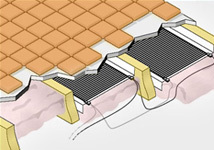 After the membrane is laid out over the subfloor, the cable is installed in the slots provided in the membrane, and the floor surface can be immediately installed over the membrane and cable. The membrane is versatile and can be used on all types of indoor and outdoor applications. And the Prodeso system is safe under all conditions and weather, and can be used to heat a wide variety of floor surfaces. It even waterproofs the substrate in the case of overlaying on cracked or imperfectly cured floors with a risk of vapor stress. 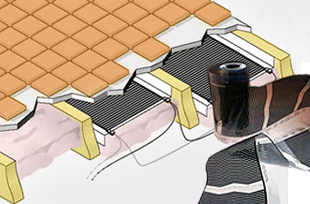 HeatShield floor heating systems mark a significant advancement in floor heating technology. The HeatShield floor insulation panels consist of a ½-inch thick polystyrene insulation covered with a thin, specially profiled aluminum. These lightweight, insulated panels reflect the floor heat upwards, thereby maximizing the performance of your floor heating system. ComfortTile heat cable can be easily installed in the pre-spaced grooves of the HeatShield, simplifying installation and ensuring correct cable spacing. 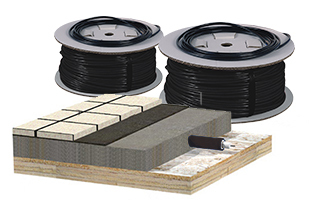 The In-Slab radiant floor heating cable is designed for installation in new concrete slab applications. 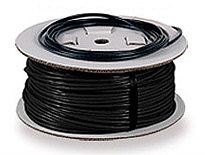 The heat cable is tied directly to the re-mesh and embedded at least ½-inch below the surface. The thermal heating cable then heats and uses the concrete slab to store and distribute heat evenly throughout its intended area. The Warmzone heat cable is affordable and can be installed under any type of flooring, including hardwood, carpet, and tile so you can enjoy radiant heated floors under any floor in your home. 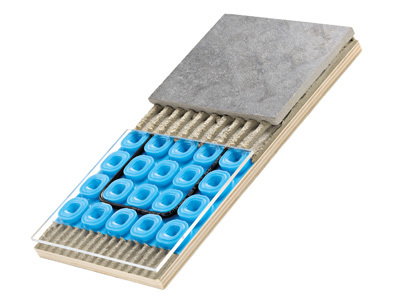 The RetroHeat floor heating system was designed specifically for providing electric radiant heat to existing floors by accessing the floor joists below. So, if you have open access to your floor joists, now you can add the comfort and efficiency of radiant floor heat to your home. The RetroHeat system can be installed to heat ceramic tile, hardwood, laminates and carpeted flooring.